The fish that got away « "TeresaBruceBooks"
My family is still stunned. I caught a fish. A huge fish. A Redfish so big I had to put it back. For those of you who read my blog on “Why fishing is nothing like dancing” earlier this year, brace yourself. My friend Terry Stone did not do the work for me this time. He did drive the boat. Loaned me a real reel and hinted that I’d have better luck casting in the lee of a nearby oyster bank than in the middle of Station Creek. But that’s it, I swear. 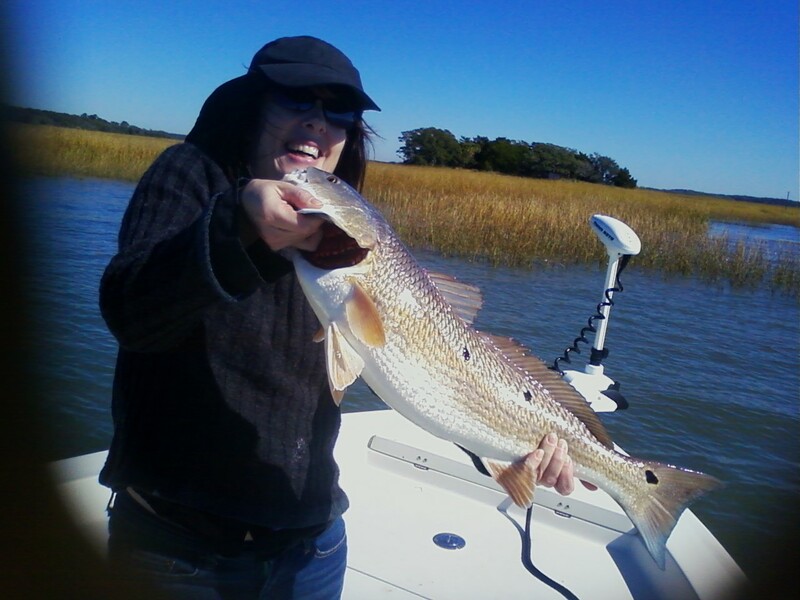 I baited the hook myself, casted without impaling anyone else on the boat and all by myself, wrestled it from the waters of the Port Royal Sound. Well, I did have a little help. From Martha Graham. Years of modern dance training finally paid off. When a fish that size hits your bait, it feels like your wrists will snap. Whiplash is not out of the question. Girly girliness is. Luckily I had strong enough thighs to grip the freeboard and not fall overboard. I instinctively pulled into a Martha Graham contraction – back rounded, stomach clenched, thighs engaged, neck taut – and got me a fish! It’s hard to believe I was once a vegetarian. The teen-me would have cheered for the fish to win the fight we had in Station Creek. But the adult-me had no such qualms. That Redfish and I were absolute equals, despite me weighing six times as much. She, and I’m sure it was a she, knew the waters better, had more to lose than I did and probably better instincts. Well, except for the part where she bit down on a half-dead minnow impaled on a sharp hook. I like to think I wouldn’t have done that. The adrenaline rush was as powerful as I’ve felt after any dance class. I’m sure that’s the only reason I let Terry talk me into sticking my hand through her gills to pose for his cell-phone photograph. Our battle wasn’t over. She clamped down on my hand like a vice, bone on bone. She defecated on my other hand, holding her up for the victory pose. And when we lowered her over the side of the boat to let her go, she didn’t stick around to thank me. In a silvery flash she left me – hooked. Man! (or rather – Woman!) – you can tell the adrenaline is still rushing! Congratulations. Congrats and when are you and Terry available next? Oh, and how much did she weigh? I’m guessing 8-10 lbs. Oh no…easily 20 pounds. Judging from my vast fish-catching experience. Terry, am I lying?